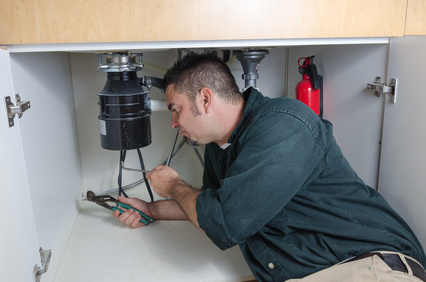 Most plumbers would tell you that the average life span for any garbage disposal is about eight to 12 years. This, of course, depends on the make, model, and horse power (HP) of the unit you have. It can also depend greatly on how often you use it and for what. If you just use it occasionally and for light food items it will generally last longer. If you use it daily and try to grind up thick items like old chicken bones or orange peels, chances are you’ll either get a clogged disposal or you’ll likely be needing a new one pretty often. There are several ways to tell if you need to start thinking about getting a new disposal. First, if you notice foul odors coming from the side of the sink with the disposal, this can be a good clue. Chances are it’s working, but not grinding up as well as it used to and leaving remains which should have drained out. Leaving food residue like this causes the smell. Another way to tell you may need to be thinking about a replacement is due to noise. All disposals make noise, but when yours starts to sound different or like it’s having a hard time doing the job, chances are it is getting ready to go out. This is often accompanied by the smell noted above. The final way is by telling when you look into the disposal and see food remains. If it’s just a matter of running the water and letting the disposal run longer, that’s not the problem. This is when you’ve run it as you should and you still see items left in there. Depending on your needs, for example, how often you cook and how often you use the disposal, will determine the actual HP you need. While you can find garbage disposals in as little as 1/3 HP, these really aren’t practical, even for people who rarely use them. They are typically made with cheaper components and they certainly can’t stand up to grinding much up. The next higher power is ½ HP and this is the lowest HP any plumber would recommend for home use. It is much sturdier than a 1/3 HP and can stand up to daily use by most families. They run about $100 for a decent unit. A ¾ HP unit will serve most kitchens, even with heavy daily use. They have the power to grind most food, even those with strings like celery. Many can even stand up to grinding potato peels. A full 1 HP garbage disposal is usually used in professional kitchens, although serious cooks at home may want to consider them. They can hold much more than other models and can grind a wide range of things. The downside is they take up a lot of room under the sink, so you should probably have a good sized kitchen before even considering this. If you live in the Melbourne, Florida area and are in the market for a new disposal, contact a licensed master plumber for help. Not only can they properly install a garbage disposal, but they can often recommend a quality brand and the right HP based upon your individual needs.